Title: 'Italie' from Discours sur L'Histoire Universelle Par Jaques Benigne Bossuet. 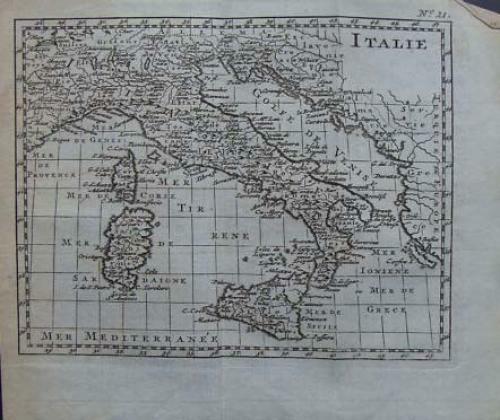 Copper engraved map of Italy with great detail of mountains, lakes & rivers. Map area is in very good clean condition for its age. Page is mostly clean & bright but has some light age toning around the page edges, mostly to left edge of page. Engravings are strong & clear. Blank on reverse. 2 fold lines as issued. Text in French.